If you must run Nmap on such a system, the easiest option is to use Nmap version 5.35DC1 or older. You can find these in the Nmap dist directory (or older still versions in dist-old. When using Nmap on Windows 2000 (either an old version as described above, or a newer version as described later on this page), a couple dependencies from Microsoft may need to be installed first. 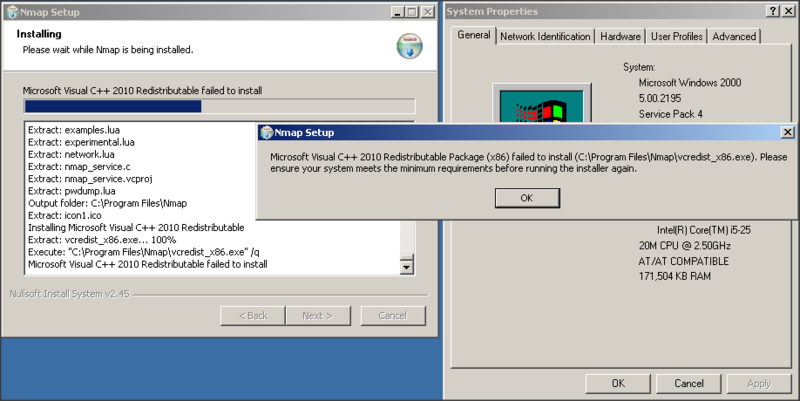 Those are the Windows Installer 3.1 (v2) and the Security Update for Windows 2000 (KB835732). After installing these, follow the general instructions in the following two sections to install Nmap.